Cissy 1962 Queen Queen Elizabeth II of England - wearing a silver brocade gown. There were several variations of the brocade pattern used for this doll. This same pattern was also use for one of the day suits that the 1961 Jacqueline came in, and for the "Sleeping Beauty" version of this same queen. The 1962 Cissy Queen was the end of an era for the 21" fashion doll. While the design of the doll itself is not game changing, she has any number of details that makes her particularly interesting. This was the final Cissy to be presented in the Alexander Doll Company's doll catalog. The doll is listed as No. 2180, 21" and named Queen Elizabeth II of England. Cissy as a queen was first introduced in 1955. The full name used for the Cissy Queen would vary. Cissy was Queen Elizabeth in 1955 & 1956. In 1957, she had a number, but not named in the company's doll catalog. In 1958 & 1960 she was again listed simply as Queen. The company catalog did not show the 1959 Cissy Queen. In 1961 Cissy was Queen Elizabeth II and in 1962, Cissy was Queen Elizabeth II of England. The gown of the 1962 Cissy Queen Elizabeth varied from the previous years of a bouffant style, and was now more like the gowns designed by Norman Hartnell for Queen Elizabeth II of England to wear herself. In 1962, FAO Schwarz toy catalog features Cissy and Jaqueline. Both are listed as 20 inch dolls vs. the Alexander Doll Company's 21 inch doll. This is something of ongoing confusing issue... was Cissy a 20 inch doll or a 21 inch doll? 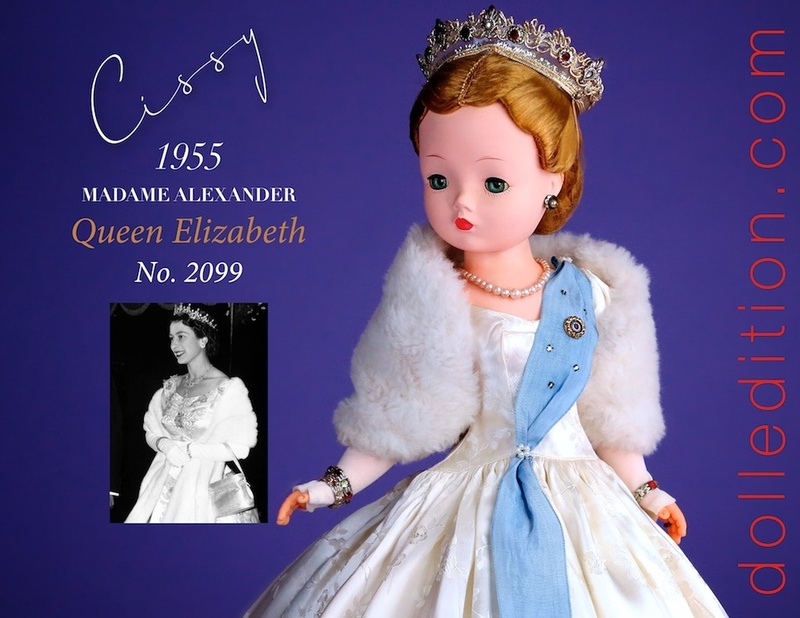 Again, the Alexander Doll Company lists Cissy as a 20 inch doll from 1955 to 1957. In 1958, Cissy became 21 inches - at least in their Company catalog. Another interesting detail are the clothes for both the 1962 Cissy and Jaqueline. The 1962 FAO catalog lists clothes that are available for both Cissy and Jacqueline. As with the company Alexander Doll Company catalog, both state Cissy and Jacqueline share the same clothes in their 1961 & 1962 company doll catalog. The tag for the years 1961 & 1962 now has changed to read "Madame Alexander," and does not specifically specify either doll. This was probably part of the company master plan as they transitioned out of Cissy, into their newest fashion doll, Jacqueline. By luck or by planning, this would work out well as Jacqueline was discontinued midyear 1962, and many stores now advertised the same doll under different names. FAO marketed the doll as "Miss Judy". Marshall Fields used the name "Jackie". Fortunately, there was not a problem correcting clothing tags. FAO Schwarz shows both the 1962 Cissy Queen and Jacqueline and lists the same clothes available for both dolls. There was also a variation of the same queen with a "Sleeping Beauty" face. She is No. 2170 vs. the Cissy Queen No. 2180. The dolls clothing tag reads "Madame Alexander". This example does not have her crown. The metal crowns, used from 1960 to 1962, were literally pinned into the dolls wig cloth base and were easily misplaced if they ever came off. Another interesting detail is the Queen's sash itself. The sash of the 1955 to 1961 the Cissy Queen is described as wearing the blue "Sash of the Order of the Garter." In 1962, the sash changes color to red, and now is described as the "Sash of the Order of Bath." Both sashes are worn by Queen Elizabeth over the right shoulder. The 1955 - 1957 the Cissy Queen wears her Order of the Garter sash on the left shoulder, but the dolls sashes changed to the right shoulder from 1958 to 1962. Queen Elizabeth herself in 1962 - same year as the last Cissy of 1962 by Madame Alexander. Queen Elizabeth wears a virtual rainbow of sashes with orders of different significants, from different countries and as prescribed by royal etiquette, on different shoulders. Yes, as you may have heard, Queen Elizabeth II is celebrating a birthday. - And a very big celebration it is. She will be 90. Cissy however, has shared a few birthdays herself. Our featured 1955 Cissy Queen No. 2099 is a beautiful 61 years young. When this Cissy Queen was made, her majesty, Queen Elizabeth, was 29. Queen Elizabeth II was a popular subject for Madame Alexander. Starting with early composition, As a doll, Princess Elizabeth did not sell well until she became the Royal Princess Elizabeth, and heir to the throne. Once her Uncle unexpectedly abdicated in 1936, her life was directly and immediately effected. For Madame Alexander, It also sent Princess Elizabeth sales through the roof! 1955 was in a period rein that Queen Elizabeth was quite glamorous. Many photos appear at his time with her in fur stoles, dripping in diamonds and a beautiful smile... all accented by her dashing Prince Philip. Cissy 1955 Queen Elizabeth by Madame Alexander, with an inset 1955 photo of Queen Elizabeth II - Both are looking regal and glamorous. The 1955 and 1956 Cissy Queen Elizabeth are almost identical. The court gown of the 1955 Queen uses a different brocade with a more open pattern. Both of the 1955 and 1956 Cissy Queen Elizabeth dolls have their sashes going from left to right. In 1957, the Alexander sashes would change, and go from right to left, as worn by Queen Elizabeth II. Queen Elizabeth II, with Prince Philip, in this 1955 photo. In this October 29, 1956 photo, Queen Elizabeth II meets Marilyn Monroe for the first time. Both 30, the two most famous women in the world have their paths cross at this moment.